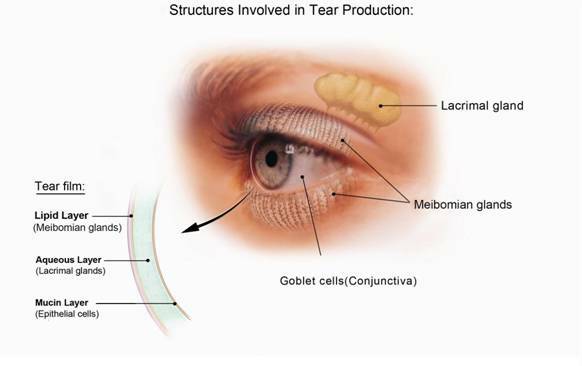 Dry eye occurs when the quantity and/or quality of tears fails to keep the surface of the eye adequately lubricated. Experts estimate that dry eye affects millions of adults. The risk of developing dry eye increases with advancing age. Women have a higher prevalence of dry eye compared with men. Belpharitis and lid marginal disorders can predispose to reduced tear film distribution. Consult a physician about switching medications to alternative ones that are not associated with dry eye. This may alleviate dry eye symptoms. Mild dry eye symptoms may be treated with over-the-counter medications such as artificial tears, gels, and ointments. Cutting back on screen time and taking periodic eye breaks may help. Closing the eyes for a few minutes, or blinking repeatedly for a few seconds, may replenish basal tears and spread them more evenly across the eye. Sunglasses that wrap around the face and have side shields that block wind and dry air can reduce symptoms in windy or dry conditions. Smoking cessation and limiting exposure to second hand smoke also may help. Cyclosporine and Corticosteroid eye drops also may be prescribed short-term to reduce eye inflammation. Punctal plugs made of silicone or collagen may be inserted by an eye care professional to partially or completely plug the tear ducts at the inner corners of the eye to keep tears from draining from the eye. In severe cases, surgical closure of the drainage ducts by thermal punctal cautery may be recommended to close the tear ducts permanently.